If you ever felt sorry for the ghosts, the orphans they left behind, and wondered what would happen when Pac-Man became the ruling elite, then this is for you. Whilst researching to see if the ZX81 was capable of doing justice to an isometric game along the lines of Ant Attack! or KnightLore I coded a program to display a single height map of tiles, and it looked a bit like a maze. 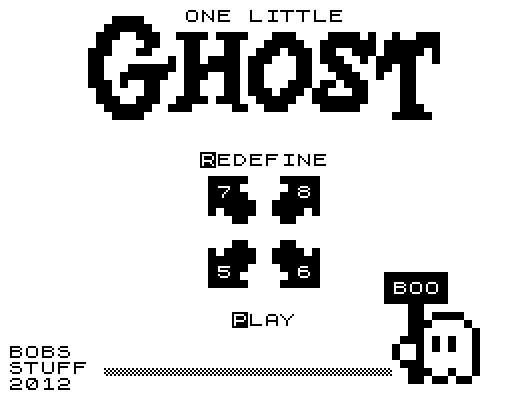 Along with the code examples, I'd also been experimenting with the graphics required for such a game, and produced a cute little ghost. An idea then began to germinate... a maze, and some ghosts? Why not try a scrolling isometric Pac-Man? I'm still not sure if a full isometric game is possible (that's for another day) but a scrolling flat one certainly is, and I'm really pleased with the results. It looks good, is fluid and responsive, and features most of the aspects of the original - including the (slightly bugged) A.I. and attack patterns. Having a ghost as the main character means that I've had to supplemented the concept of 'lives' for 'spirit' - I mean, a ghost doesn't have a life, does it? - which introduces a slight twist on how you play the game. MicroMart - "Bob Smith has done it again with another superb release for the ZX81. This is a pacey, technically impressive, playable and addictive high-quality release. This is, for now at least, the best game for the monochrome 8-bit that I've ever played. I'm sure even Sir Clive Sinclair would like this one"
SirMorris (RWAP ZX81 forums) - "This game rocks more than a cross-channel ferry with a broken stabilizer"